You've probably already heard about the terrifying accident Monday on the Ninja roller coaster at Six Flags Magic Mountain: A derailed car struck a tree, injuring four and leaving the riders hanging perilously for three hours. Luckily, these kind of incidents aren't too common — in most ride malfunctions, things shut down and everyone gets out safe and sound. But even in those more mundane shutdowns, just the experience of hanging there for minutes or hours has got to be disorienting, frightening, and awful, right? 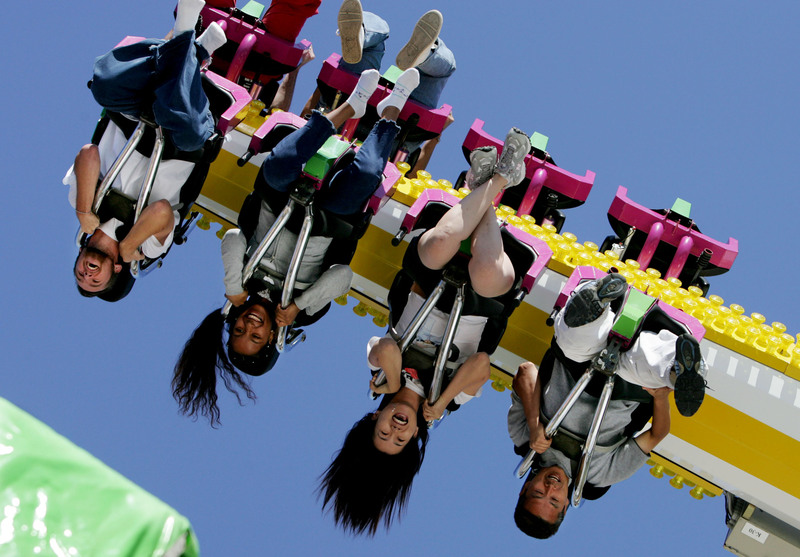 The only thing that could possibly be worse — outside of the insanity that happened at Six Flags — would be to get stuck upside down. But, oh yeah, that does happen. While it's less frequent, people do get stuck hanging there sometimes. Personally, I will never have to entertain this possibility: While I'm not so scared as to avoid all theme park rides, it's a matter of firm personal policy that I'll never set foot on a loop-de-loop, largely for reasons just like this. But some people out there are far braver, and unfortunately, the reward for that bravery has very occasionally been a long, grueling stay upside down. Argh. This, in a way, is a good thing. The sudden halts often aren't "breakdowns" but deliberate safety features, as was the case on the Mumbo Jumbo. Sadly, though, that safety mechanism landed those five people a tense, dizzy 20 minutes suspended upside down, 50 feet above the ground. Indeed, MSNBC, this can't be fun. While riding the X-Coaster at Arkansas's Magic Springs & Crystal Falls theme park, an unlucky dozen people got stranded hanging 150 feet above the ground for 30 minutes, a stoppage that park officials attributed to a bird or some manner of animal interfering with the coaster. One of the dozen was taken to the hospital for severe neck and head pain, while a little girl, according to rider Connie McDade, was frightened and suffered a nosebleed. This was a big one. The Demon roller coaster at Six Flags Great America in Gurnee, Illinois, had a hell of a shutdown in 1998, ultimately having consequences for both the passengers trapped aboard and the company itself. The riders were stranded upside down for an unthinkable two hours, while park officials and firefighters sought to free them. Four people ended up hospitalized. Subsequent investigations suggested that the shutdown was the result of a safety system kicking in due to a mechanical failure, a fact which Great America emphasized in their own defense. But they didn't escape without paying a price — the riders were awarded $442,000 by a jury in 2001. In 2011, at an amusement park in China's Shandong Province, a roller coaster ride boasting just two passengers, a father and son, broke down mid-loop, leaving the pair hanging helplessly while park staff tried to figure out what had gone wrong. Usually, these stories either end with the mechanical issues being straightened out, or the authorities being called in. But thanks to the damp ground beneath the coaster, soaked with recent rains, bulldozers and cherry-pickers were out of the question. The pair had to sit there for 30 minutes while staff tried to figure out what to do. Their ultimate solution, as reported by The Telegraph, was simply to pull on the car with ropes until it dislodged, sliding down the rails to the bottom of the loop — a welcome ending, sure, but not as safe and practiced a strategy as you might like to see. Both father and son went to the hospital following the incident.